BREVARD COUNTY, Florida – Almost three years after she was rescued, a female manatee has returned to the Florida’s natural waters. 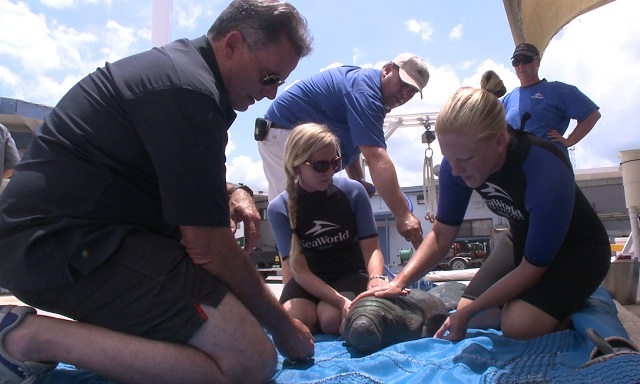 Amidst cheers and bittersweet tears, SeaWorld Orlando’s Rescue Team returned Blanche to Port St. John, Florida and watched her swim away, ready to begin her life in the wild. On July 21, 2014, Blanche was an orphan calf, estimated to be only two weeks old, when she was found swimming alone in the Indian River Lagoon. She was rescued by Florida Fish and Wildlife Conservation Commission (FWC) and brought to SeaWorld Orlando. Weighing in at only 48 pounds and measuring 48 inches in length, Blanche required around-the-clock care, including regular bottle feedings. She responded well to the immediate care she received and continued to thrive at SeaWorld’s Manatee Rehabilitation Center. Each day marked another day closer to the ultimate goal of being returned to her natural environment.